Guaranteed to add some geometric style to your outfit. This stranded colourwork knitting project is part of our fashion-led collection of easy-to-follow knitting patterns from TOFT. Made using super soft pure wool yarn, this knit kit will keep you cosy whatever the weather. 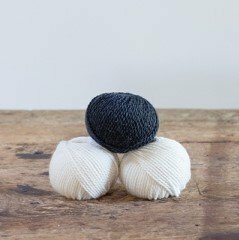 THIS KIT CONTAINS: 50g of TOFT's luxury DK Yarn in your choice of colour (shown here in Cream) and 25g in a contrast colour of your choice (shown here in Charcoal). The pattern is provided digitally in .pdf format. You can download this from a link that will appear in your MY TOFT area and at the bottom of your order confirmation email, which you can save or print at your own convenience. YOU WILL NEED: 4mm circular needles (60cm). VITAL STATS: Hat measures approx. 23cm from crown to base when flat after washing and blocking.